James P Bennett, Jr. M.D., Ph.D.
A major goal of Neurodegeneration Therapeutics, Inc (NTI) is to use information from next-generation sequencing (NGS), a technique that measures gene expression, to develop new therapy combinations for neurodegenerative diseases. This update summarizes recent work by NTI on sporadically occurring ALS (sALS, ~90-95% of cases). The cells used in this work began as a particular type of white blood cell (mononuclear cells) from disease-free “control” adult subjects’ blood samples. They were then placed into culture and transformed into pluripotential stem cells (“induced” pluripotential stem cells, iPSC’s) using a method described in Nature Protocols (Dowey et al., 2012). By manipulating the incubation medium, we transformed the resulting iPSC’s into neural stem cells (NSC) that contain markers for glia and neurons (types of cells found in the brain). By additional manipulation of cell culture conditions, it is possible to change the NSC’s even further into motor neurons like those in the spinal cord (O’Brien et al., 2015). In 2016, our group reported (Brohawn et al., 2016) that ALS spinal cords showed gene expression patterns suggesting inflammation as a major abnormality. In that RNA-sequencing study (using NGS), nine genes were identified that were both differentially expressed genes (DEG, compared to control spinal cords) and also were “hub” genes, which appeared to control the activities of multiple other genes. When we introduced plasmids (pieces of circular DNA) into the NSC to increase expression of these DEG/hub genes, we found that expression of six of the nine DEG/hub genes reduced the survival of NSC’s made from disease-free subjects. In other words, we appeared to be able to kill “control” NSC’s by expressing genes that were increased in ALS spinal cords and were also major controllers of other genes (ie, were “hub” genes). One could view this as changing control NSC’s into ALS NSC’s, providing a cell model of sALS that could be used to test drug treatments. The graphs below represent our first attempt to test drugs in this cell model. We tested drugs that could detoxify oxygen free radicals (R(+) pramipexole, resveratrol) or stimulate mitochondrial biogenesis (increase mitochondrial mass; resveratrol, bezafibrate, PQQ (pyrroloquinoline quinone), recombinant human mitochondrial transcription factor A, rhTFAM). Both of these processes have been found to be abnormal in ALS tissues. 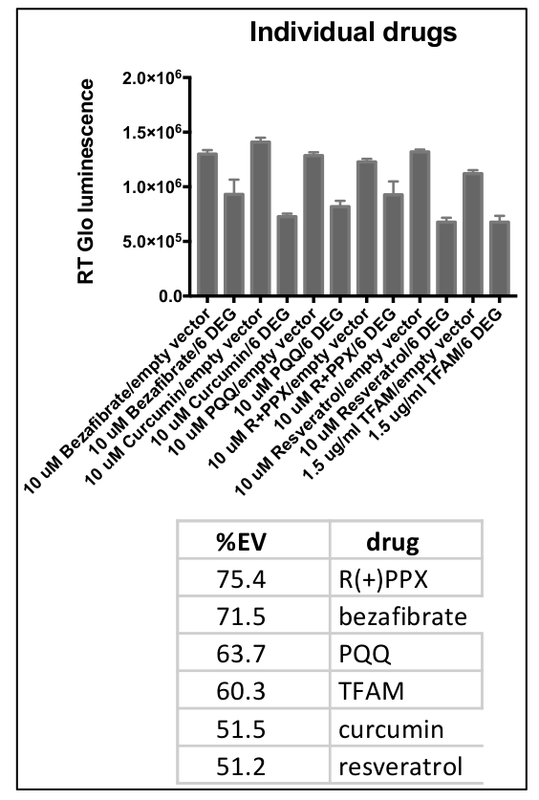 Figure 1 shows drugs tested individually. “EV” = empty vector, which refers to NSC exposed to plasmid without any gene to be expressed. In other words, EV controls for any effects of the plasmid DNA, detergent used to get the plasmid into the NSC and solvents used to dissolve the drugs. All drugs were tested at 10 micromolar (M) concentration. We found that curcumin and resveratrol had minimal effects (DEG treatment normally results in ~50% loss of live cells). The other 4 drugs tested had viability-preserving effects, prompting us to carry out the experiment in Figure 2.
viability of the NSC and totally overcame cell death brought about by the DEG’s. treating ALS, but they are very encouraging results. Test drugs in NSC lines made from ALS patients (we have one line that will be ready for testing soon). This might suggest “personalized treatment” for individuals with sporadic ALS, depending on which drug combinations have the greatest effect in their cells. Widen the study to include other drugs, such as riluzole, masitinib and edaravone that have shown promise in treating ALS degeneration. Brohawn, D.G., O’Brien, L.C., Bennett, J.P., Jr., 2016. RNAseq Analyses Identify Tumor Necrosis Factor-Mediated Inflammation as a Major Abnormality in ALS Spinal Cord. PLoS One. 11, e0160520. Dowey, S.N., Huang, X., Chou, B.K., Ye, Z., Cheng, L., 2012. Generation of integration-free human induced pluripotent stem cells from postnatal blood mononuclear cells by plasmid vector expression. Nat Protoc. 7, 2013-21. O’Brien, L.C., Keeney, P.M., Bennett, J.P., Jr., 2015. Differentiation of Human Neural Stem Cells into Motor Neurons Stimulates Mitochondrial Biogenesis and Decreases Glycolytic Flux. Stem cells and development. 24, 1984-1994.